For Zavistovski, creating is healing. When he was diagnosed with lymphoma, he remembered hearing frightening stories about poor survival rates. But he said to himself and those around him, “No way — I’m going to fight this.” He immediately set to work and remarkably, completed the first half of the sculpture [titled Hope] during his course of chemotherapy. 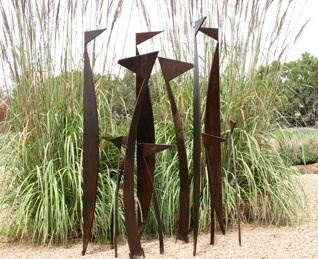 He became immersed in creating large, contemporary, minimalistic sculptures. Art, Zavistovski believes, offers a way out of one’s self and out of one’s disease. “When you look at a work of art, or listen to music, the chemistry of the brain acts in a positive way, and the positive inspiration helps with healing.